A VC points to a post by Godin, who surmises that, "like the marketers of Oreos (now in 19 flavors of cookies), we're dealing with clutter by making more clutter." To which I say.... is this blogging-explosion-clutter-fest a surprise to anybody? "In a world of over 50,000 postings per hour, and over 70,000 new weblogs created each day, keeping on top of and in tune with the most interesting and influential people and topics is the new frontier beyond search....the long tail of the blogging world goes out to 27.8 million blogs." This is the world we live in; the hellish world of the long-tail. Which brings me back to the blog. 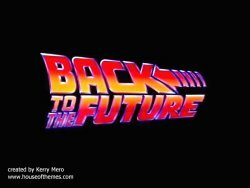 Back to the Future is one of my favorite movies from the 80's, so let's travel back in time to 2002 for a bit of blog-talk. If I had to choose between blog-clutter today and blogging circa 2002, which would I choose? Here's the list of Technorati's Top 100 from November, 11, 2002. Here's the list of Technorati's Top 100 from today. #1 on Technorati's list in 2002 was Scripting News - it had 744 links. #1 on Technorati's list today is Boing Boing - it has approximately 66,753 links. Are we grateful to live in a geeked-out techno world that spits out real-time information/news? Then why complain about the fact that it's too much? And please, let's not pretend like this is a newsflash, ignoring the fact that those complaining about the clutter are also the key contributors. In his infinite wisdom, Dan Quayle said, "It's a question of whether we're going to go forward into the future, or past to the back." You gotta love it. For the sake of Dan, let's go past to the back just once more. I cut my blogging teeth on Recruiting.com and ERE. For the better part of six months, I spent my day flip-flopping back & forth 'tween the two. I read Jason Davis, Canadian Headhunter, Anthony J. Meany, and Jim Durbin. Then, I'd cruise over to the folks at ERE - David Manaster, Dr. John Sullivan, Lou Adler, et al. I didn't visit just once, but several times each day. I was a sponge. And I was grateful for the info-overload as it allowed me to learn at my own pace - to pick 'n choose from the best the recruiting blogosphere had to offer. Before long I was leaving comments, writing posts, and interacting with recruiting colleagues across the globe. Involved in something much larger than myself, I became an active part of the recruiting community. So yeah, I'm digging this blogging thing - that's an understatement. It is growing exponentially and we all share in the growing pains - we've got the clutter and long-tail to prove it. But does that mean we quit? Taper off? Thankfully, Godin's not advocating quitting, but he would seemingly be much happier if we took a breather and tapered off a bit. He just believes that "what we've got here is a conflict for resources between individual interests and the common good." Stop the presses! Call 911! If that's the worst problem facing the bloggers & the blogosphere, then we've got it pretty good. And to make us all feel a little better about the straits we're in, let's take a little trip on the WayBack Machine. Take a peek at Jason and gang circa November 2003. Please note the text in the "about" box which says, "The Domain name Recruiting.com is for sale." Yes, I'm nodding my head too. We are very fortunate Jason saw past the clutter and decided not to sale. Yes we are. Tip your hat to David Manaster's genius circa January 1999. What started as an email discussion list for recruiters has evolved into something much, much larger. We are grateful for David's vision. So, here's to the (r) evolution of blogging. It's bound to take a few more tricky turns in the years to come, so enjoy the ride. I know there's ground to be gained by doing our part to clean up some of the clutter, but I'm willing to live in a bit of clutter if the end-result finds that I am a better recruiter. When I am a better recruiter, my customer is better served. And my customer is the only person I'm out to impress. Fun post looking back at the old websites. Mind you, there was no "Jason and gang" on Recruiting 101 in 2003. Just Jason. Anthony and I started Canadian Headhunter in January 2004 and merged with Recruiting.com (born Aug 2004) in April 2005.